The military intelligence group that comprises QAnon continues to make extraordinary revelations about behind the scenes efforts to displace and remove U.S. officials that make up or have been compromised by the Deep State. 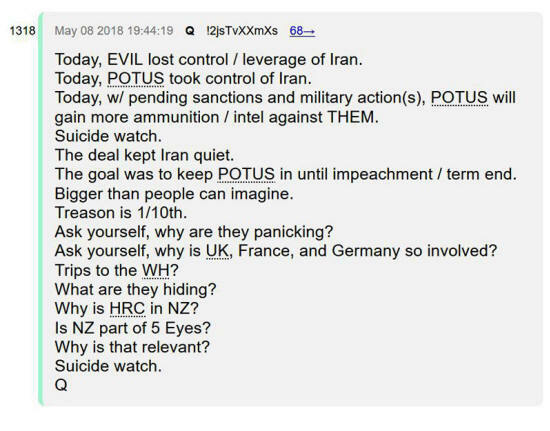 Most recently, QAnon has been focusing on why President Donald Trump's withdrawal from the July 14, 2015 Iran nuclear deal is a positive development, and how this is connected to Trump helping free North Korea from Deep State control. ...use the enormous funds at their disposal, to manipulate national elites, organizations and even nation states. 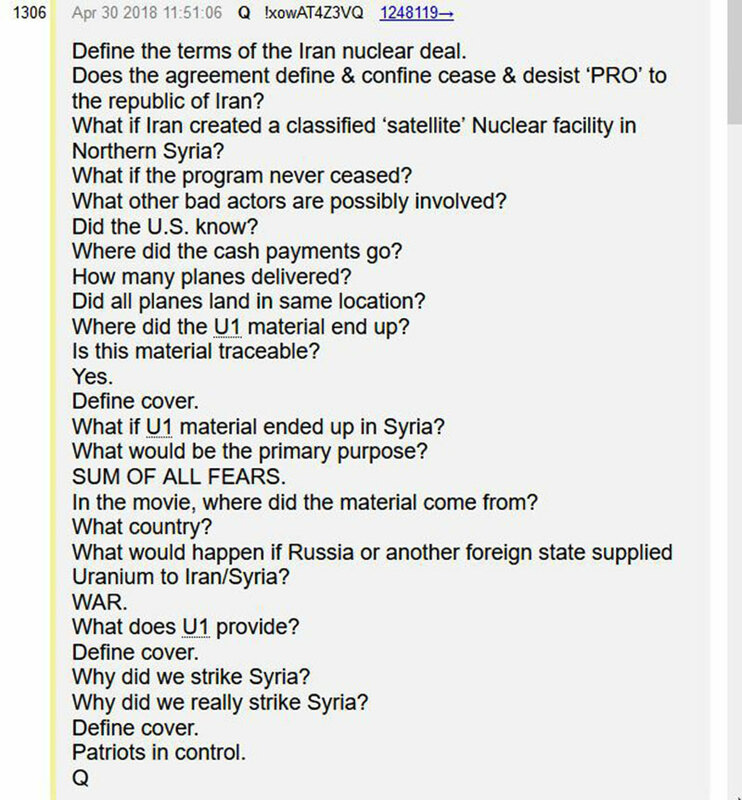 In brief, QAnon had emphasized how Deep State officials involved in the Uranium One deal with Russia, had arranged for some of the uranium to be secretly shipped to northern Syria. Then, it would end up at an Iranian nuclear facility initially built there with permission by the Assad regime. For a detailed discussion of the above QAnon post see a previous article. Apparently, Senator John McCain's visit(s) to Syria were a cover for some of this Russia destined uranium to be secretly handed over to Syrian opposition figures that would supply it to rogue operators linked to the Iranian nuclear program. QAnon released photos showing McCain with Syrian opposition forces associated with the Islamic State, and suggested that McCain's visit was a cover for delivering something that would help the Deep State agenda - allegedly uranium from the batch sold to Russia. 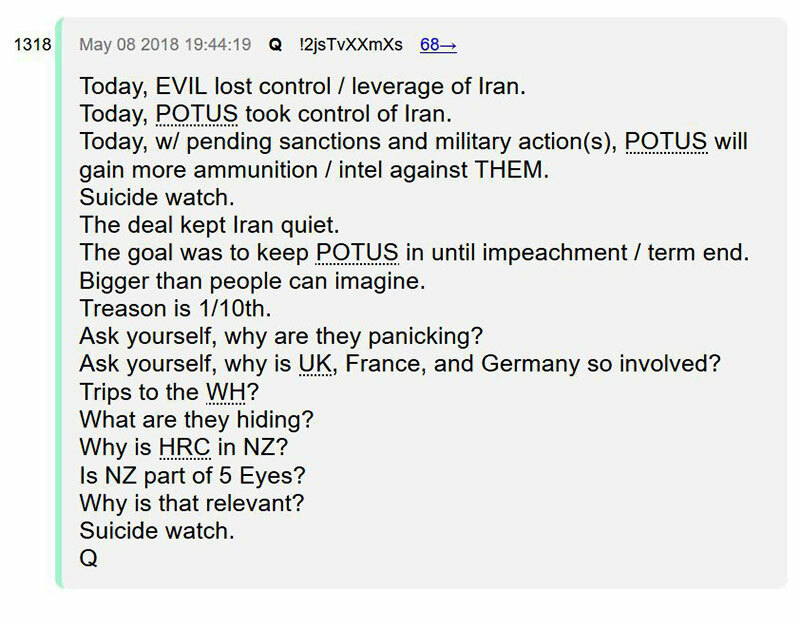 QAnon was suggesting that McCain, Syrian opposition groups and the Iranian nuclear program in northern Syria were all controlled or manipulated by the Deep State. The ultimate goal was to use the nuclear weapons produced by the Iranian facility in one or more false flag attacks, which would lead to retaliatory U.S. military strikes against Syria, Iran and/or Russia that would culminate in a Third World War. What gives this scenario plausibility is that the Deep State has long wanted to fulfill biblical prophecy by laying waste to Damascus in a future apocalyptic showdown between major world powers. The first reference to this Deep State plan was a series of posts by an alleged "Illuminati" insider using the name "Hidden Hand" back in October 2008. In posts on the Above Top Secret Forum, he pointed to a secret plan to destroy the cities of Damascus and San Francisco by 2010. Former Forbes Magazine editor, Benjamin Fulford, was told the same thing three years later by his insider contacts in Japan. Fulford did not give a timetable suggesting that the plan was still in development. This Deep State plan to use the secret Iranian nuclear facility in a false flag attack was thwarted by the Trump administration's missile attacks on multiple Syrian military facilities on April 14. An alleged chemical weapons attack in the Douma suburb of Damascus was used as the pretext for the Trump Administration authorizing the attack against the secret Iranian nuclear facility. This is where QAnon claims that Trump's administration, which is fully backed by the U.S. military, is methodically freeing multiple nations from Deep State control. Paradoxically, by pulling out of a peace deal with Iran, this makes it possible for Deep State influence to be ended, thereby making a genuine peace with Iran possible. Such a peace deal could only occur after Iran is freed from Deep State manipulation and/or control. What makes the above scenario plausible is the case of North Korea, which is now on the verge of a comprehensive peace deal that will transform the Korean peninsula. 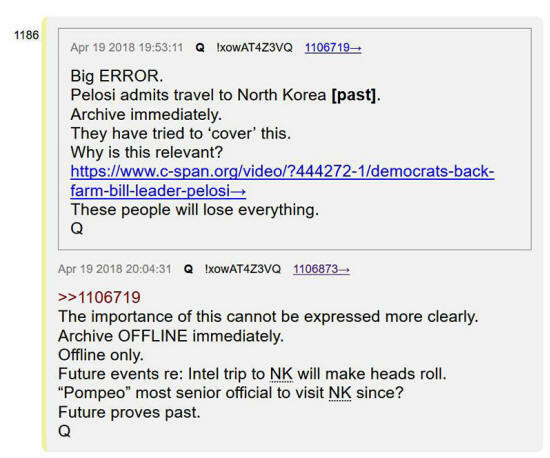 QAnon has revealed how North Korea was similarly freed from Deep State influence over a secret nuclear weapons program. The key elements for this Deep State influence over North Korea was that Deep State officials had facilitated the export of North Korea's ballistic missile technology to international buyers. 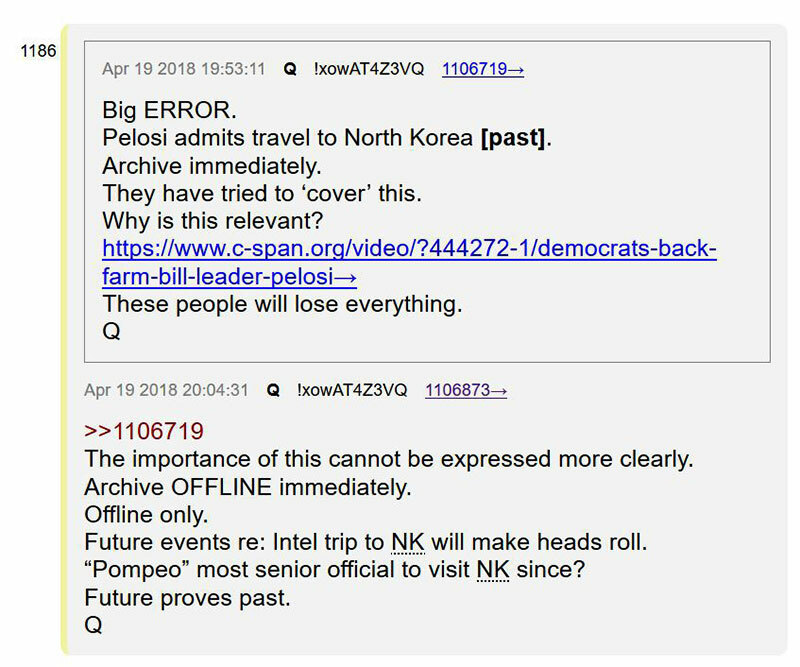 QAnon highlighted a video showing how the former speaker of the U.S. House of Representatives, Nancy Pelosi, had indeed referred to this secret missile export program as means of North Korea funding itself. When we went to Pyongyang, and we talked about missiles, we talked about MIAs and POWs, we talked about home, we talked about a number of subjects. Essentially, North Korea was being manipulated by the Deep State to export ballistic missile technology, which could be equipped with nuclear warheads, to the international arms market. The Deep State had aided North Korea in quickly developing its ballistic missile program despite international sanctions. This helps explain why North Korea's missile program developed so rapidly despite severe funding limitations - the Puppet masters were secretly funding it all! What ended the Deep State's influence over North Korea was the failed ballistic nuclear missile attack against Hawaii on January 13, 2018. The Deep State deployed a ballistic missile capable submarine that is part of a Dark Fleet controlled by the CIA, to launch a nuclear false flag attack against Hawaii. However, the Deep State plan failed when a U.S. Air Force run secret space program intercepted the nuclear missile using its global surveillance network and orbital based weapons platforms. This was discussed at length in previous articles (see here and here) and explained why the US Air Force has broken away from the Deep State. 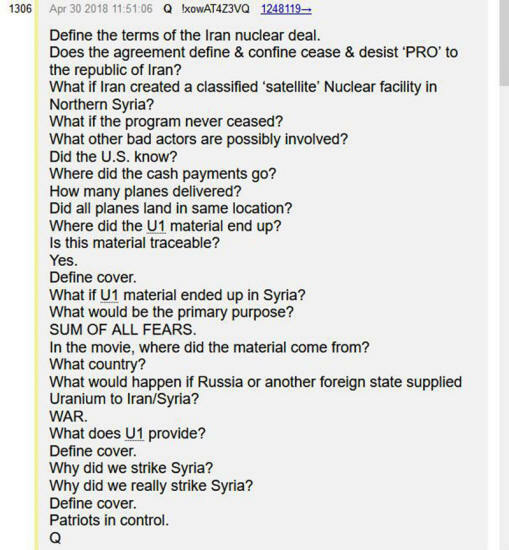 QAnon is essentially saying that something similar will happen as Deep State assets in Syria are exposed and neutralized, thereby ending the secret Iranian nuclear program there, which was always intended to frame Iran/Syria as the culprit for a nuclear false flag attack against the U.S. or its major regional ally, Israel. In order to fully gauge the significance of QAnon's claims regarding Trump ending the Iran nuclear agreement, we need to consider recent claims by Alex Jones and Dr. Jerome Corsi that QAnon is Deep State disinformation. Corsi in particular says that while the initial military intelligence group that began posting in late October 2017 was genuine and was linked to President Trump, it had been recently compromised. The evidence provided by Jones and Corsi for this stunning turn-around is very sketchy and dubious at best. QAnon responded to Jones and Corsi's criticisms by endorsing a highly detailed critique which raises many troubling questions about how Jones and Corsi have approached the QAnon information from the outset. My own insider sources affirm that QAnon continues to be the real deal and that there has been no change to his/their status on the 8chan posting boards. This suggests that QAnon's information continues to be accurate disclosures by military intelligence figures associated with the Trump administration, and QAnon's coded and cryptic information tells us much about Deep State operations around the world. In sum, while Donald Trump's ending of the Iran peace deal is causing many to be anxious about the increased likelihood over a looming nuclear confrontation, it may be that we will witness something similar occurring to what recently happened with North Korea. Paradoxically, ending a flawed peace deal facilitated by the Deep State secretly planning to use the deal to orchestrate a nuclear false flag attack that would implicate Syria, Iran and Russia, may well create the opportunity for a genuine international peace deal with Iran. 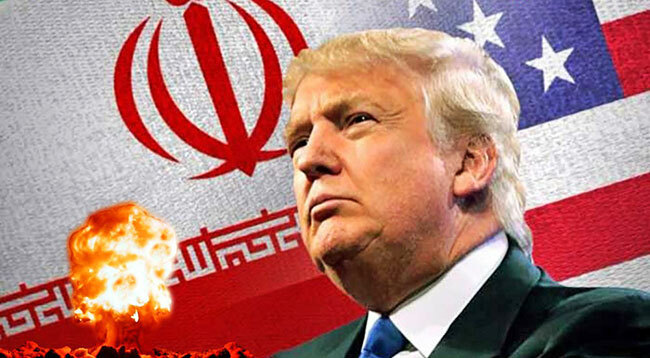 More importantly, Trumps action will free Iran of Deep State influence through its covert funding of rogue Iranian operations in Syria and elsewhere.